In the sixth century, the Byzantine Emperor Justinian commanded the building of a Greek Orthodox monastery on Mount Sinai, at what is considered the very location where Yahweh first appeared to Moses in the burning bush, just under the site of his later appearance to the gathered nation of Israel to whom he delivered the Ten Commandments. For this reason, it is easy to see how important Mount Sinai remains as a testimony to God’s revelation of himself through his Word, not only spoken and written by his own finger in the Decalogue, but today, as it is preserved in over 1,200 complete manuscripts and thousands of fragments. For 1,700 years, the Holy Monastery of Saint Catherine at Mount Sinai has provided a home to these important sources of information regarding the transmission of the New Testament text. In the nineteenth century, the efforts of Constantine Von Tischendorf made the great Codex Sinaiticus accessible to the world of textual criticism and Biblical scholarship. For decades, Bible scholars worked with ancient New Testament manuscripts often by use of black and white images on micro film, which has its limits in conveying their contents. “In 1975, when a treasure trove of more than 1200 manuscripts was discovered in a hidden store room, St. Catherine’s became the second largest institute in possession of ancient manuscripts, just behind the Vatican” (“A Texan at Mt. Sinai: Meet Father Justin,” CSNTM November 2011 Newsletter). Today, digital photography is increasing accessibility and deepening our understanding of these ancient records. This cutting edge work is being conducted by the work of St. Catherine monastic, Father Justin, the first non-Greek admitted into the fellowship of the ancient monastery. Born Russell Hicks, a native of El Paso, Texas, Father Justin became interested in Saint Catherine’s monastery and the monastic life as a student at the University of Texas at Austin when he read “Island of Faith in the Sinai Wilderness,” an article on the monastery published in the January, 1964 edition of National Geographic Magazine. In 1978, Hicks was privileged to visit the monastery for two days. “He would end up spending twenty years at a monastery in Brookline, Massachusetts, before coming to St. Catherine’s Monastery. When Father Justin applied to the monastery, Archbishop Damianos broke a long-standing tradition and allowed him to make his home there; he was the first non-Greek to live at the oldest continuously inhabited monastery in the world, built in the sixth century by Emperor Justinian” (CSNTM Newsletter, 11/2011). There are currently about 25 Greek Orthodox monks living in St. Catherine’s monastery. Father Justin explained that the number had previously been as low as 7 back in 1955, but renewed enthusiasm for monasticism increased their number thanks to the influence of a few charismatic elders in the intervening years. 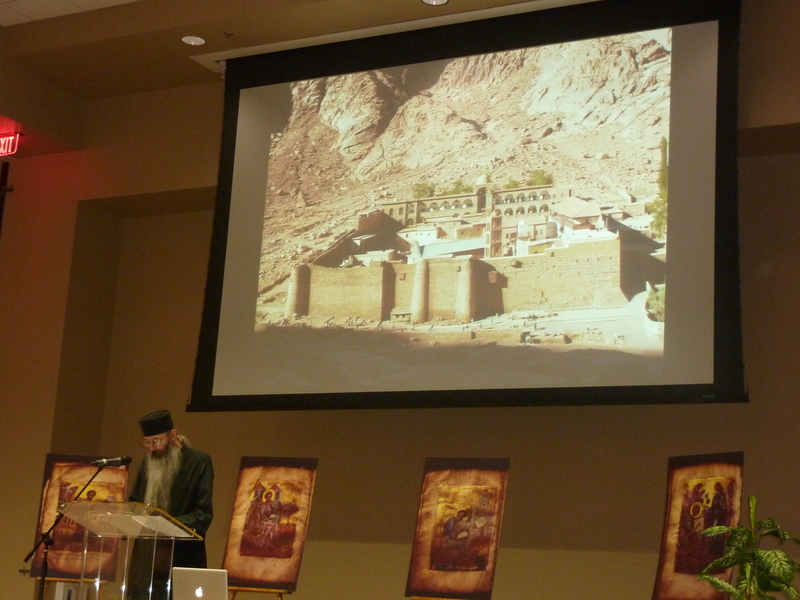 Father Justin is currently touring America, speaking on the monastery library he now oversees as well as the significance of all of the Sinai manuscripts to textual criticism, raising funds for the expensive work of digitally preserving the images of these ancient documents. 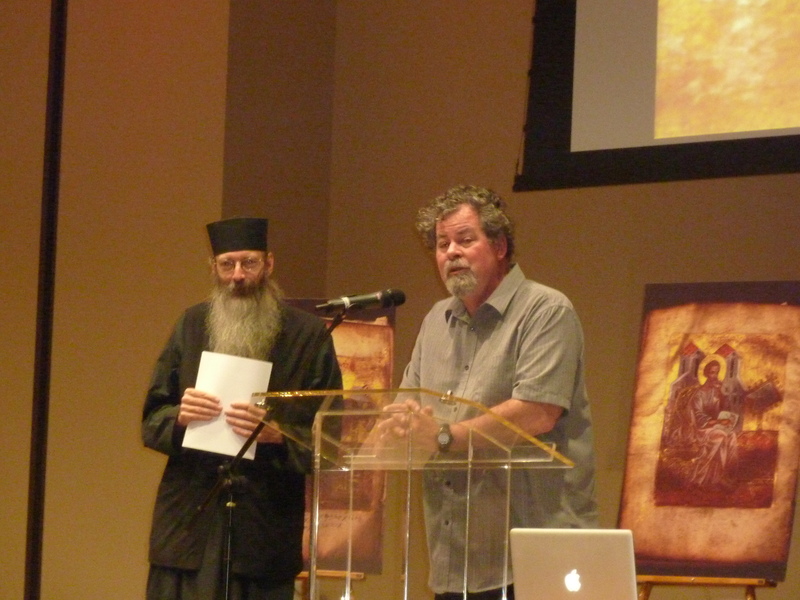 Tuesday and Wednesday, November 8-9, 2011, Father Justin was hosted by Dr. Daniel B. Wallace of the Center for the Study of New Testament Manuscripts at the Hope Center in Dallas, the site of this informative symposium. Tuesday night, Father Justin spoke on “The Mission and Work of the St. Catherine’s Library,” introducing his audience to four sample manuscripts, describing their age, contents and condition, and describing the process of their digital preservation. He went into so much detail that I regret to report that I was unable to take many usable notes. I often found his soft-spoken delivery from lips rendered unreadable behind his long, gray beard difficult to hear. But there was one interesting detail I managed to retain: many of the manuscript images in Father Justin’s PowerPoint presentation often featured small portions of red text among a page of text in black ink. Justin explained that these red portions are called rubrics, using a red ink derived from the carmine of beetles. Rubrics in liturgical texts usually provided directions for priests, distinguishing it from the black text featuring responsive texts intended to be read by the congregation. Because of the older method of reproducing such manuscripts by means of black and white micro film, scholars sometimes found it necessary to travel to the location of the manuscripts themselves to view them in person in order to distinguish rubrics from responsive readings. 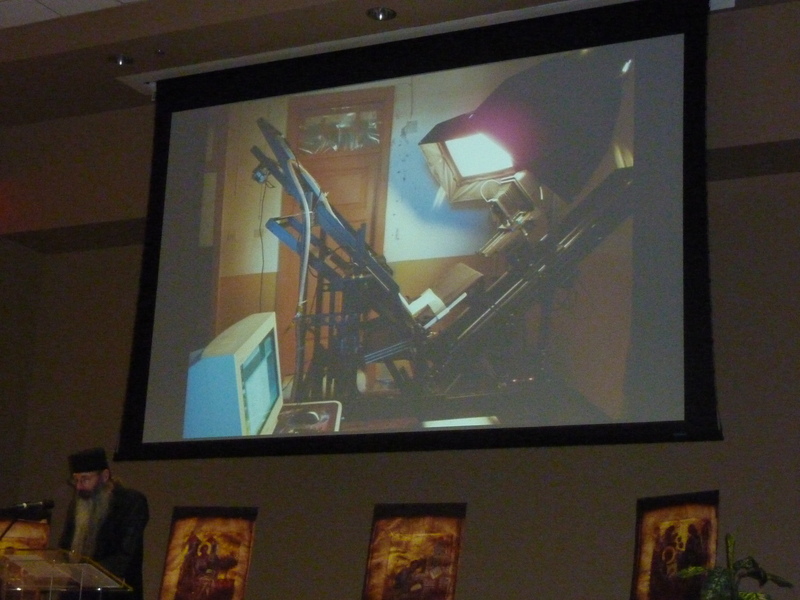 The Sinai manuscripts are digitally imaged by this camera. We were also treated to a couple of interesting shots of Father Justin’s digital camera. In order to protect the fragile binding of ancient manuscripts, they are cradled so that the codex may be held open at no more than a 90 degree angle. These cameras utilize the same technology as that which sharpens fuzzy images of celestial bodies and other sights in outer space. In the question and answer period following his presentation, Father Justin also spoke on the dire need of better cataloging of their many manuscripts. He pointed out that the Vatican’s library of manuscripts is so much better cataloged because nuns study library science and apply this knowledge to their unique collection. This is a practice that has yet to be undertaken among the monks at Saint Catherine’s monastery. His partial chronology of efforts to catalog the Sinai manuscripts begins in 1728 when the archbishop at the time gathered the manuscripts housed in various locations in the monastery, but the variety was so diverse that his efforts were unsuccessful. In the mid-nineteenth century, more cataloging took place, but these efforts were little more than lists which did not elaborate to any extent on the contents or condition of the texts. In 1911, a complete catalog was compiled, but the quality of the information remained rudimentary compared to the Vatican library’s work. This shows us how much work remains in the processing of all the data available in the multitude of witnesses providentially preserving the transmission of the text of the New Testament. I’m looking forward to tomorrow’s presentation on “The Significance of the Sinai Texts for New Testament Study.” Lord willing, a comparable review of it will follow.